Does Atheism Really Make Sense? "The true philosophers are ever studying death, to them, of all men, death is the least terrible. Look at the matter in this way: how inconsistent of them to have been always enemies of the body, and wanting to have the soul alone, and when this is granted to them, to be trembling and repining; instead of rejoicing at their departing to that place where, when they arrive, they hope to gain that which in life they loved (and this was wisdom), and at the same time to be rid of the company of their enemy. Many a man has been willing to go to the world below in the hope of seeing there an earthly love, or wife, or son, and conversing with them. And will he who is a true lover of wisdom, and is persuaded in like manner that only in the world below he can worthily enjoy her, still repine at death? Will he not depart with joy? Surely he will, my friend, if he be a true philosopher. For he will have a firm conviction that there only, and nowhere else, he can find wisdom in her purity. And if this be true, he would be very absurd, as I was saying, if he were to fear death." Of course in the Orthodox tradition, as opposed to Platonic philosophy, the body itself is good as a creation of God. Man is not whole unless he possesses both body and soul, hence the great horror of the Fall which made us slaves to the passions which bring death and the separation of soul and body. Hence also the great significance of Christ's resurrection from the dead, Who conquered death by His death in order to liberate us from the fear of death which made us slaves to the passions and the desires of the flesh, uniting the dichotomy of body and soul through our own resurrection from the dead. "For the body is a source of endless trouble to us by reason of the mere requirement of food; and also is liable to diseases which overtake and impede us in the search after truth: and by filling us so full of loves, and lusts, and fears, and fancies, and idols, and every sort of folly, prevents our ever having, as people say, so much as a thought. For whence come wars, and fightings, and factions? whence but from the body and the lusts of the body? For wars are occasioned by the love of money, and money has to be acquired for the sake and in the service of the body; and in consequence of all these things the time which ought to be given to philosophy is lost. Moreover, if there is time and an inclination toward philosophy, yet the body introduces a turmoil and confusion and fear into the course of speculation, and hinders us from seeing the truth: and all experience shows that if we would have pure knowledge of anything we must be quit of the body, and the soul in herself must behold all things in themselves: then I suppose that we shall attain that which we desire, and of which we say that we are lovers, and that is wisdom, not while we live, but after death, as the argument shows; for if while in company with the body the soul cannot have pure knowledge, one of two things seems to follow-either knowledge is not to be attained at all, or, if at all, after death. For then, and not till then, the soul will be in herself alone and without the body. In this present life, I reckon that we make the nearest approach to knowledge when we have the least possible concern or interest in the body, and are not saturated with the bodily nature, but remain pure until the hour when God himself is pleased to release us. And then the foolishness of the body will be cleared away and we shall be pure and hold converse with other pure souls, and know of ourselves the clear light everywhere; and this is surely the light of truth." Here Plato encourages a life of purity giving the most minimal concern for the body in order to subject the body to the soul. He continues that by doing this the philosopher and lover of wisdom will attain a state of illumination. This falls in line with christian teaching that a soul and body that has not been purified cannot become a temple of the Holy Spirit. Purification comes through asceticism and prayer while living a life in Christ united to the Church. Just as our Lord warned His disciples to "watch and pray lest you enter into temptation, for the flesh is weak but the spirit is willing", so also Christians are called to make sure they do not fall into temptation by giving power to the spirit over the flesh through asceticism. This brings illumination which does not come from ourselves, but is a gift of the Holy Spirit for Whom a temple we are called to be. "For I deem that the true disciple of philosophy is likely to be misunderstood by other men; they do not perceive that he is ever pursuing death and dying; and if this is true, why, having had the desire of death all his life long, should he repine at the arrival of that which he has been always pursuing and desiring?" "And when you see a man who is repining at the approach of death, is not his reluctance a sufficient proof that he is not a lover of wisdom, but a lover of the body, and probably at the same time a lover of either money or power, or both?" It is only in light of these things that the great ascetic feats of the Desert Fathers make sense, as well as that of contemporary monks and ascetics (and even the ascetic practices of Christians living in the world). 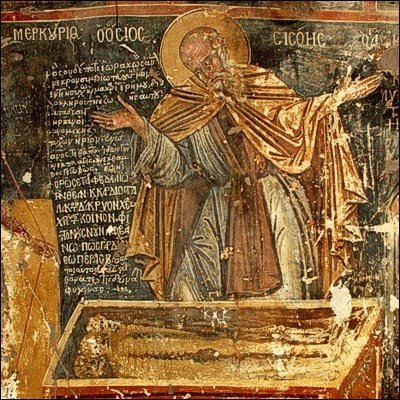 Many incidents from the life of St. Sisoes can be found in the Sayings of the Desert Fathers (Apophthegmata ton Pateron). This Saint, great and renowned among the ascetics of Egypt, lived in the fourth century in Scete of Nitria. After the death of Saint Anthony the Great, he left Scete to live in Saint Anthony's cave which was abandoned; he said of this: "Thus in the cave of a lion, a fox makes his dwelling." St. Nikolai Velimirovich writes of him in his Prologue: "Imposing difficult labors on himself, he humbled himself so much that he became meek and guileless as a lamb. For this God endowed Sisoes with abundant grace so that he was able to heal the sick, drive out unclean spirits and resurrect the dead. Sisoes lived a life of austere mortification in the wilderness for sixty years and was a source of living wisdom for all monks and laymen who came to him for counsel and advice." 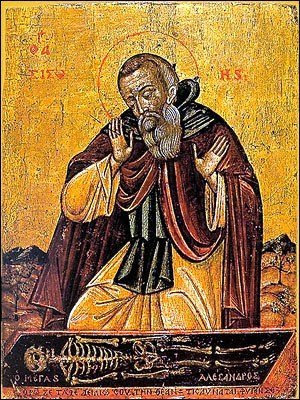 - St. Sisoes taught the monks: "Regardless in what way temptation comes to man, a man should give himself to the will of God and to recognize that temptation occurred because of his sins. If something good happens, it should be said that it happened according to God's Providence." - One monk asked Sisoes: "How can I please God and be saved?" The Saint answered: "If you wish to please God, withdraw from the world, separate yourself from the earth, put aside creation, draw near to the Creator, unite yourself to God with prayers and tears and then you will find rest in this time and in the future." - Another monk asked Sisoes: "How can I attain humility?" The Saint replied: "When a person learns to recognize every man as being better than himself, with that he attains humility." - Ammon complained to Sisoes that he could not memorize the wise sayings that he read in order to repeat them in conversation with men. The Saint replied to him: "That is not necessary. It is necessary to attain purity of mind and speak from that purity placing your hope in God." - Another brother asked Abba Sisoes, "I have fallen, Abba; what shall I do?" The elder said to him, "Get up again." The brother said, "I have gotten up again, but again have I fallen." The elder said, "Get up again and again." So the brother asked, "How many times?" The elder replied, "Until you are taken up either in virtue or in sin. For a man presents himself to judgment in that state in which he is found." - One day a man came wanting to be a monk and he had a son. Sisoes commanded him to throw the son into the river, which he was only just stopped from doing by the brothers who brought the Elder's counter-command. He went on to become a proficient monk having learned the value of obedience as a means to attaining humility. - Another man from the world came to Sisoes with his son, who died on the way. The father prostrated himself before the Abba, leaving the boy's corpse there. Thinking the child had merely failed to get up again after the prostration, Sisoes commanded him to arise; which he did, and went out, whole. Sisoes was distressed for he did not intend to raise the dead; he charged everybody to keep silent concerning this matter for as long as he lived. - A brother who had been wronged by another brother came to see Abba Sisoes. He said to him, "My brother has hurt me and I want to avenge myself." The old man begged him, saying, "No, my child, leave vengeance to God." The brother said, "I shall not rest until I have avenged myself." The Elder said, "Brother, let us pray." Then he stood up and said, "God, we no longer need You to care for us, since we do justice for ourselves." When he heard these words, the brother prostrated himself before the Elder's feet and said, "I will no longer seek justice from my brother. Forgive me, Abba." Sisoes died in extreme old age in the year 429 A.D. It is the details of his death that he is most famous for. 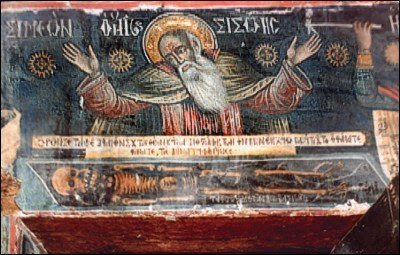 In light of Plato's Phaedo, St. Sisoes died as a true philosopher and lover of wisdom after having purified himself to become an illumined temple of the Holy Spirit. "They would say of the venerable Sisoes that, when he was at the end of his long life of labors, as the fathers were gathered about him, his face began to shine as the sun, and he said, 'Behold, Abba Anthony is come;' then, 'Behold, the choir of the Prophets is come;' his face shone yet more bright, and he said, 'Behold, the choir of the Apostles is come.' The light of his countenance increased, and he seemed to be talking with someone. The fathers asked him of this; in his humility, he said he was asking the Angels for time to repent. The fathers told him, 'You have no need of repentance, Abba.' Abba Sisoes responded, 'I tell you the truth, I have not even made a beginning of it.' Thus they learned he was perfect. Again his face became as bright as the sun, so that the fathers were filled with fear. He said, 'Behold, the Lord is come, and He says, "Bring Me the vessel of the desert,"' and as he gave up his soul into the hands of God, there was as it were a flash of lightning, and the whole dwelling was filled with a sweet fragrance." 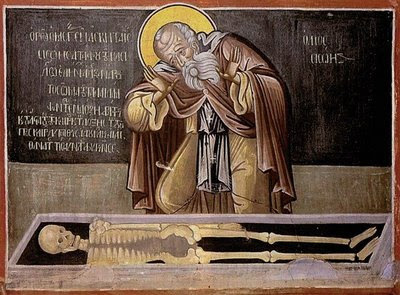 Concerning the icon of St. Sisoes staring over the dead bones of Alexander the Great, we do not know for sure if this depicts a historical event. We do not have a historical account of what the icon describes until its depiction first starts appearing in monasteries in Greece following the Fall of Constantinople in 1453. The astonishment of Sisoes has been an icon of contemplation for all Christians, especially for monastics, since the 15th century and has spread so much in popularity that it appears throughout hundreds of Greek churches and monasteries. 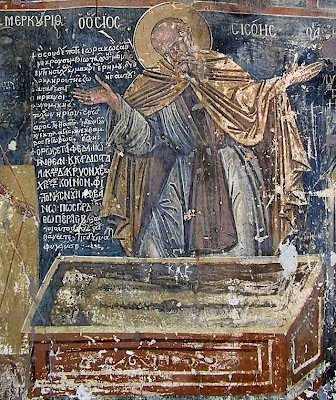 Among the most famous come from Holy Trinity Monastery and Varlaam Monastery at Meteora, and Hosios Loukas. The place in the church where this icon usually appears is on the opposite side of the altar area as people exit the church, where also the Dormition icon of the Theotokos also appears. It is wisely placed here so Christians can contemplate death as they leave the church. It is no coincidence that this icon became so popular after the Fall of Constantinople. Constantinople, once the seat of the Roman Emperor from the time of Constantine the Great, always looked to Alexander as one of the most exemplary of rulers. In fact, this was a tradition of all the Roman Emperors. The historian Dion Cassius (155-235 AD) reports that after Augustus had visited the body of Alexander in Alexandria, he was asked if he also wanted to visit the tombs of the Ptolemies, the sovereigns of Hellenistic Egypt. He refused, saying: "I came to see a king and not dead men". Roman universal rule was considered an inheritance of the Roman Emperors received through Alexander. "It was the most renowned and respected shrine in the Roman Empire, the object of veneration by Julius Caesar, Cleopatra, Octavian, Caligula, Hadrian, Severus, Caracalla and a host of other luminaries. It stood for centuries within a sacred precinct the size of a large town at the heart of the greatest Greek city in the world. Yet at the end of the 4th century AD, when the Christian emperor Theodosius outlawed paganism, it disappeared without trace, creating the greatest archaeological enigma of the ancient world. What became of the tomb of Alexander the Great? Does any part of it still survive?" "Ammianus Marcellinus relates an incident which took place in about AD 361. The Patriarch (Christian Archbishop) Georgius is said to have posed a rhetorical question to the Alexandrian mob concerning a tall and splendid temple of the Genius of Alexandria: 'How long shall this tomb stand?' he enquired. By 'Genius' Ammianus meant the tutelary deity of the city and this could well mean Alexander. Certainly, Alexander is the only figure to whom this expression might apply whose tomb also lay within the city. A few years later in AD 365, Alexandria was struck by a phenomenal earthquake followed by a gigantic tsunami, which is reported to have wrought havoc in coastal regions and port cities throughout the eastern Mediterranean. Alexandria is reported to have been particularly hard hit with ships being lifted onto the roofs of surviving buildings. This is the most probable occasion of the destruction of the Soma Mausoleum. A quarter of a century later, in a newly recognised reference, Libanius of Antioch mentioned in an oration addressed to the emperor Theodosius that Alexander's corpse was on display in Alexandria. This would fit with the tomb chamber having eventually been excavated from beneath the rubble of the ruins. It also provides an occasion upon which the corpse might have been removed and separated from the sarcophagus, which would explain why the latter was found in a vacant state by Napoleon's expedition. A year or so later, Theodosius issued a series of decrees outlawing the worship of pagan gods, among whom Alexander was to the fore. In Alexandria, the Christians rioted and destroyed the Serapeum, the leading pagan temple. This is the point where the continued worship of the founder's corpse would have become unconscionable to the Alexandrian authorities. This is the time that Alexander's remains finally disappear from history. 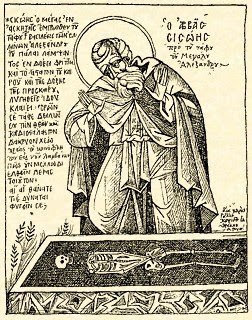 At the very end of the 4th century or early in the 5th, John Chrysostom was able to assert in a sermon that Alexander's tomb was then 'unknown to his own people', that is to say, to the pagans of Alexandria. A few decades later Theodoret listed Alexander among famous men whose tombs were unknown." In light of this information, it is not implausible that the depiction of Sisoes lamenting over the tomb of Alexander is a historical event lost to us in document form but survives only in iconography. In many ways, the iconographic tradition is just as reliable historically as is a written document. Since Sisoes was a contemporary of the events described above regarding the destruction of Alexander's tomb, I would find it difficult to believe that such a wise disciple of Anthony the Great living outside Alexandria would not at least make some comment in this regard. Sisoes lamenting over Alexander is also a lament over an ideology. It is not by coincidence that both men are known by the epithet "Great". At one time, during Roman rule that lasted over a millennium and a half, Alexander was an icon of the Empire, but now that the Empire was gone the Romans looked to monastics as the only hope for suffering Orthodoxy under the Ottoman Muslims. It is this outlook which formed the Orthodox mentality during this period. 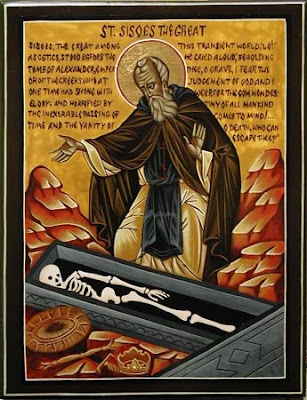 That is not to say that it did not exist before, since this was always a part of christian and monastic tradition, but now Sisoes stands over Alexander's dead bones alive and learning the great lesson of the vanity of worldly glory. Roman glory may have vanished, but the Kingdom of Heaven reigns forever. It would be good for Orthodox Christians today to learn from this icon, and keep focus on who is truly "great" in this icon. There seems to be so much reverence for Alexander the Great, that we tend to forget that he is a dead hero no longer worthy of emulation. Our true role models ought to be the wise Saints, like Sisoes. Thou didst prove to be a citizen of the desert, an angel in the flesh, and a wonderworker, O Sisoes, our God-bearing Father. By fasting, vigil, and prayer thou didst obtain heavenly gifts, and thou healest the sick and the souls of them that have recourse to thee with faith. Glory to Him that hath given thee strength. Glory to Him that hath crowned thee. Glory to Him that worketh healings for all through thee. In thy struggles, thou wast as an earthly Angel, shining light upon the minds of all the faithful ceaselessly with thy divine signs; and for this cause, venerable Sisoes, we honour thee faithfully.